I’m lucky enough to have worked at many of the amazing and beautiful wedding venues we have in Scotland. It therefore seems only right that I should mention some of my favourites and a few special ones that I may have visited in another capacity or would love to photograph one day! Whether you’re searching for a historic castle, a beautiful lochside wedding, a rustic barn, or something more city chic, you’ll find it here! Of course, this list is subjective and there will be other fabulous venues that I haven’t mentioned so don’t panic if yours is not here! Everyone will have their own favourites and that’s absolutely fine! I absolutely love Cottiers! If you’re looking for a Glasgow-based city wedding venue, this is one you must pay attention to. Beautifully decorated and absolutely charming! Check out some photos from Emily & Michael who were married here earlier this year. 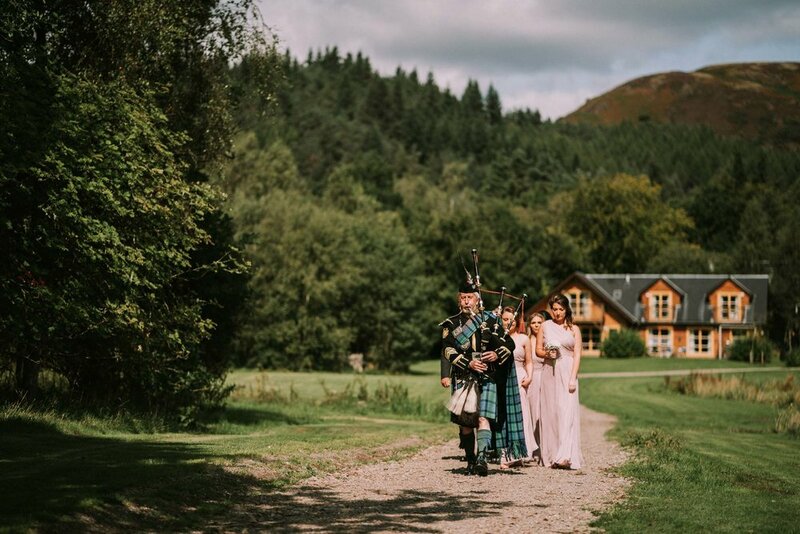 I love a Loch Lomond Wedding, and this exclusive little venue is nestled in some of the most stunning scenery Scotland has to offer. With beautiful wood interior, and panoramic views across the loch, it is one of my favourites! Take a peek at some photos from Jade & Graham’s beautiful wedding here. A beautiful, elegant castle hotel, nestled in the countryside in the Scottish Borders. See more from this stunning venue from Claire and Dale’s wedding below! Another Loch Lomond venue, this time up by Balmaha and perfect if you fancy an outdoor ceremony by the loch, surrounded by acres of private land. An absolute treat of a venue, but don’t take my word for it - here’s some photos from Alice & Colin’s beautiful wedding day last year. Located just outside Edinburgh, this versatile venue is an impressive space which can hold both indoor and outdoor weddings. With award-winning food and very friendly staff, this is another must see! Check out some photos from Naomi and Daniel’s fabulous wedding day here. Dalhousie is the perfect fairytale wedding venue. Elegant and full of character, this is a popular venue for those eloping to Scotland. Check out some gorgeous photos from Jonathan and Adele’s stunning wedding, including the owl ring delivery from the onsite falconry. The Stables are a beautiful blank canvas, giving couples complete freedom over how they style their day. Beautifully atmospheric and intimate, this one is a real gem! Another beautiful barn venue, which is flexible in layout and offers couples the chance to add their own personality to their big day! A fabulous option for couples looking for an exclusive barn venue in Ayrshire. If fairy lights and whisky barrels is your thing, this is another must see! Perfect for couples looking for a grand wedding venue, Airth Castle offers flexible spaces with glamorous touches and is surrounded by lovely grounds and countryside. If striking architecture is your thing, and either you or your partner is a current or past student, Glasgow UniversIty has several fabulous options for couples to consider. This charming, converted tin-shed overlooks the beautiful orchard of Knockraich Farm in Fintry, Stirlingshire. A beautiful and unique venue full of natural character and perfect for couples to make their own! This lovely Edinburgh venue has it all - beautiful setting, romantic gardens and a beautiful space with lots of natural light. Check out Jakki and Marc’s wedding for a sneak peek at this little gem! This luxury country house in Perthshire is nestled in acres of natural woodland, overlooking the River Tay and perfect for those that want to celebrate in style! If you love the idea of getting married amidst surroundings of lush greenery and have an appreciation for all things natural and vintage, the Secret Herb Garden just outside Edinburgh could be the venue for you! This popular St Andrew’s venue is ideal for a barn wedding! Lots of character, yet a completely blank canvas for couples determined to do it their way. A beautifully well-maintained and refurbished rustic barn venue, nestled amongst 150 acres of private parkland. Conveniently located in Perthshire, this atmospheric venue is perfect for couples looking to express themselves fully on their wedding day. Another stunning and truly iconic Scottish Wedding Venue, in the heart of Glasgow’s West End and just across the road from the beautiful Botanic Gardens. This absolutely gorgeous venue has so many unique features, including the famous celestial ceiling mural, which you can see more of by taking a nosy at some photos from Rachel & Paul’s stunning winter wedding here. GG’s is a stunningly idyllic country wedding venue, with spectacular views over the Southern Scottish coastline. Think rustic stone, wooden beams and glittering chandeliers. If this is the atmosphere you’re looking for, check it out!